A unique project, Spark:York, which opened to the public on 4 May 2018, will reinvent Piccadilly thanks to funding totalling £150,000 from the Business Enterprise Fund (BEF). This includes £50,000 from the Northern Powerhouse Investment Fund, NPIF – BEF & FFE Microfinance. York-born and bred Tom McKenzie (25) and Sam Leach (24) had a vision to establish affordable space in the city, add value to the community and create social change. 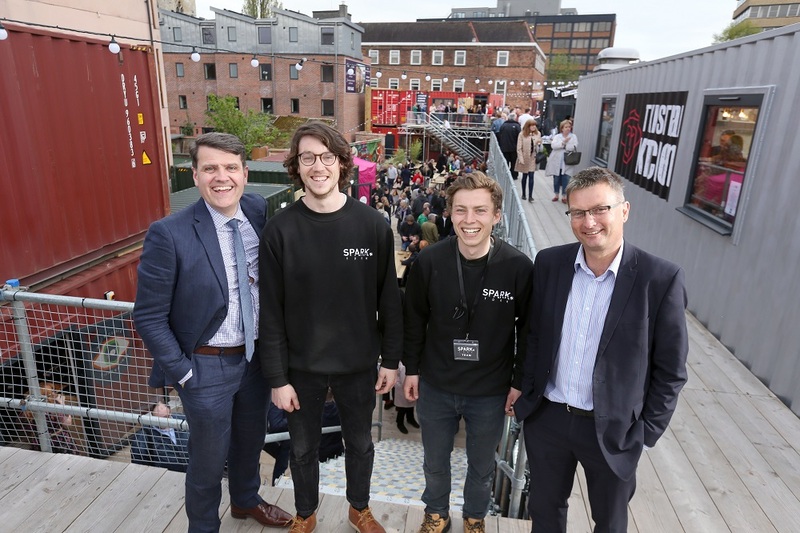 When travelling around Europe they were inspired by box parks and community and street food markets and just 18 months later, with support from BEF, the hub made from shipping containers is making a huge impact on the Piccadilly area of York. The three £50k loans, of which one has already been paid back by the entrepreneurs, were used for building works and pulling the site together which is now home to 23 independent businesses. Tom McKenzie, co-founder and director at Spark:York, said: “We currently have two part-time employees working with Sam and I but after the first month of being open we’re planning to expand our team significantly. Alongside the other businesses and retailers here at Spark:York, we’re hoping to bring 100 new jobs to the area. The Business Enterprise Fund has an office on Blake Street in York and provides funding for businesses across Yorkshire and the North East.